If you must restart a scene from scratch, you can completely erase a scene's exposure sheet. When you clear a scene, you delete all exposure sheet database information and reset the scene as if it were completely new. When you clear a scene, you are only deleting the files from the database; the Control Center module does not actually delete any image files (drawings, scan, final frames). If you have questions concerning the contents of a scene, you should contact the technical director responsible for the scene in question. If you must clear a scene from the Control Center module, make sure no one else is currently using the scene's data. If you clear a scene that someone else is working on at that moment, you run the risk of corrupting the files and losing work. If you must clear a scene, you should wait until everyone is offline to ensure that no one can open the data files while you clear them from the Control Center module. 1. Select the environment, the job, and the scene you want to clear. 2. 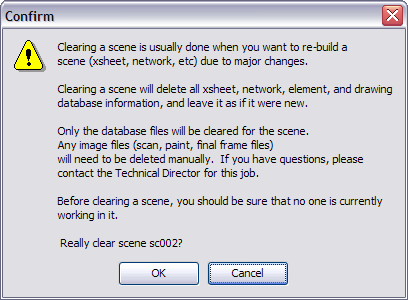 In the top menu, select Scene > Clear. You can also right-click anywhere in the Scenes list and select Clear. ‣ Click OK to clear the data from the scene. ‣ Click Cancel to cancel the clear command. The Scene list refreshes itself and displays blank elements and drawings lists, showing that the Control Center module has deleted the exposure sheet for the scene you cleared.